Six in every ten Australians have at least one social media account — the big ones being Facebook, YouTube, Instagram, and Snapchat. This heavy use of social media coincides with television losing young viewers at an accelerating rate as smart phones and tablets grab an increasing share of our attention. It’s a shift that savvy advertisers and marketers are acutely aware of and has led to the rise of social media influencer marketing. Social media influencers are social media users who have established credibility in a specific industry. They have access to a large audience and can persuade others by virtue of their authenticity and reach. So important is this style of marketing that roughly two-thirds of marketing departments are looking to increase their influencer budget. For every $1 spent on influencer marketing, businesses on average generate $6.50 in revenue. Take Crowd Mobile (ASX:CM8 | FWB:CM3) for example. 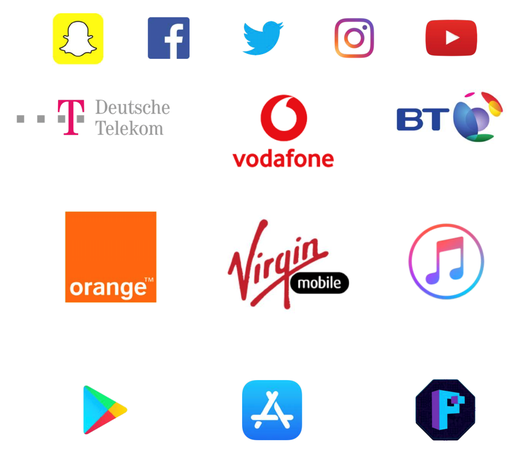 The dual ASX and Frankfurt-listed global mobile entertainment and digital media company creates digital platforms, builds mobile products, and works with digital influencers across social media channels. Recognising the growing opportunities in this space, the company is transitioning from its past product centric position to a platform company focused on marketing through technology — predominantly to millennials. That strategy was acted on last month when CM8 secured a partnership with US$8.7 billion social media giant, Snap Inc. (NYSE:SNAP) to assist in creating unique brand experiences. This is a significant step for CM8 as Snap Inc.’s global multimedia messaging app, Snapchat, has approximately 188 million daily users. As of one of only six global Snap Certified Partners, CM8 will leverage the Snap Inc. platform across e-commerce, direct response and data-driven advertising for its own products and clients. The partnership provides better access to Snap’s technology and limited beta test programs, as well as validation to external brands and clients of CM8 being as a leading performance marketing partner. While the partnership announcement is significant, CM8 has already been working closely with Snap for several years for its own Q&A division products, and has recently been using Snap for external clients, including large Fortune 100 companies. The Q&A division connects those seeking answers with qualified experts, while the Subscription division delivers mobile content including games, apps, music and video. The company’s divisions are all underpinned by its mobile payments and distribution network. The Crowd Media division is focused on the digital influencers industry and is where CM8 plans to concentrate most of its attention going forward. The division includes Crowd.Agency, a digital influencer marketing agency, and Crowd Affiliates, which helps Fortune 500 companies acquire new customers on a CPA (cost per acquisition basis). 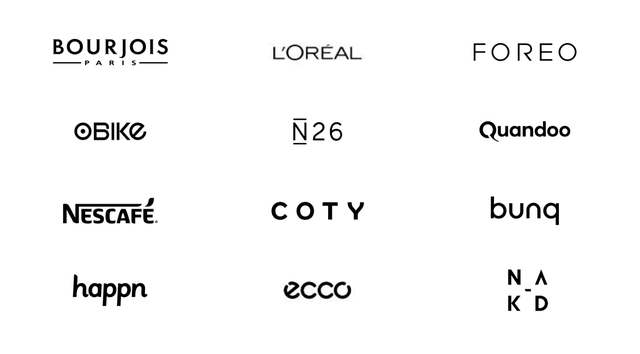 The division works with brands, digital influencers and affiliates while continuing to attract blue chip partners including L’Oréal, Nestlé and Snap Inc. The strategy is already paying off. First half 2019 revenues are forecast to be 250% higher than total revenues for the entire previous financial year. 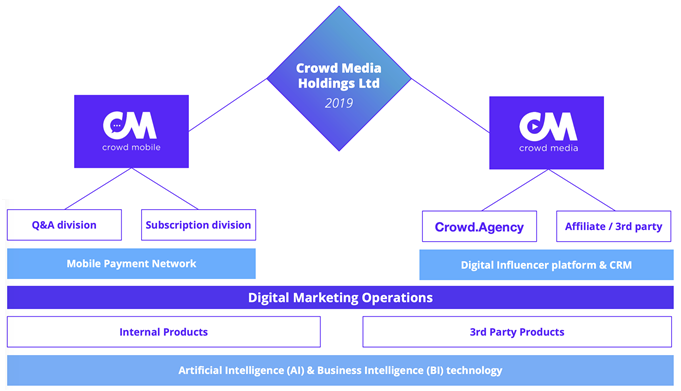 CM8 is making the transition from a product centric company to a platform company focused on marketing through technology, so is adopting a new name — Crowd Media Holdings Ltd, while the ASX code will remain the same. This name change will take place at the upcoming AGM on 28 November 2018 to reflect the new strategic direction in this high growth area. With a market capitalisation of just $7.3 million and a 3.3 cent share price, there’s plenty of upside potential on offer as the company continues to shift its focus towards the growing social media marketing industry. 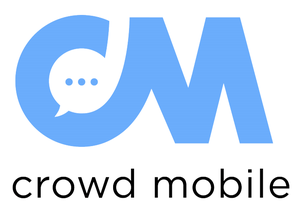 Dual-listed on the ASX and German FWB-XETRA exchanges, Crowd Mobile is the world’s largest Q&A entertainment and technology service provider. It is strategically capitalising on the rise in social media use, and in particular the shift currently underway to social media influencer marketing. It is looking to further capitalise on this trend and grow following the launch of a Share Purchase Plan (SPP) to provide extra working capital for the business. CM8 is aiming to raise $700,000 and have earmarked the funds to strengthen the balance sheet, pay down debt and provide extra working capital. The issue price per share will be $0.038 per share, which represents a 5% discount to the VWAP of CM8 shares traded on the ASX during the 30-days prior to November 7. The growth focus is social media. The following graphic provides an idea of scale of social media’s reach in the US by age group. As the population ages, social media usage, and influencer marketing with it, is only going to become more widespread and influential. With a track record stretching seven years of selling its products on social media, CM8 is uniquely positioned to capture this massive opportunity. Current influencer agencies are predominantly local, but brands want global/regional coverage and this is where CM8 excels. It has a high conversion through Artificial Intelligence (AI) and Business Intelligence (BI) and is running more than 200 monthly campaigns across all social media platforms. 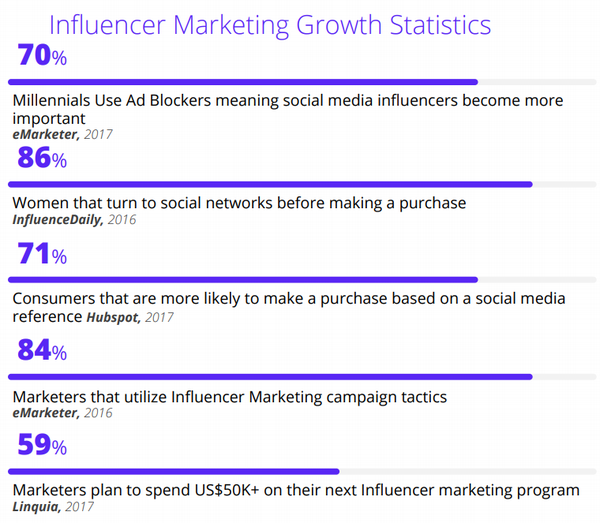 Here are some interesting stats that highlight the growing importance of social media influencers for companies — especially those targeting the millennial customer. CM8 generates revenues via three divisions — Crowd Media which includes Influencer Agency and Affiliate Agency, as well as Q&A and Subscription. Management is clearly on the right track as CM8 shifts its primary focus on the Crowd Media division, as evidenced a FY19 revenue growth forecast from the company on November 7. CM8 anticipates revenue for the division to come in at $1.25 million for the first six months of the 2019 financial year, compared to revenue for the entire 2018 financial year of $500,000 — a 250% rise. 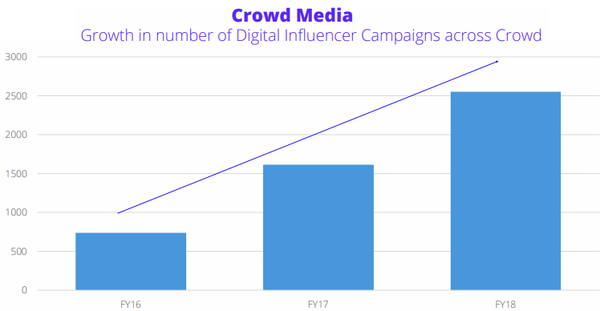 If the existing trend of its digital influencer campaign numbers continue, we can expect a positive carryover to the financials. This growth has reinforcing management’s conviction in social media marketing and its rebrand to Crowd Media Holdings Ltd. The Crowd Media division works with brands, digital influencers and affiliates while continuing to attract blue chip partners including L’Oréal, Nestle & Snap Inc.
Here’s an update from CEO Domenic Carosa and his management team discussing its recently launched digital influencer division Crowd Media while also providing a general update on business performance. Crowd Agency works with brands and digital influencers to deliver branded content aimed at millennials within the European market. The agency has a proprietary technology-based Blockchain inspired influencer CRM, unique to Crowd. Crowd affiliates allows companies to acquire customers on a CPA (cost of acquisition basis) and leverages Crowd’s expertise and platforms in social and influencer marketing. Pilot program is with a USA based Fortune 100 company since June 2018. More information on CM8’s strategic influencer marketing can be found here. As mentioned, CM8 was last month certified as a partner of Snapchat owner, the US$8.7 billion Snap Inc. (NYSE:SNAP) to assist in creating unique brand experiences. Snapchat is a major social media platform and the partnership is a significant win for the small cap, CM8. As one of six global Snap Certified Partners, CM8 will leverage the Snap Inc. platform across e-commerce, direct response and data-driven advertising for its own products and clients. This partnership further validates CM8 to potential clients and will provide it with better access to Snap’s technology and limited beta test programs. It will include quarterly face-to-face workshops with Snap which will enable the small cap to improve its offering and ultimately generate increased revenue for its products and that of its agency partners. CM8 is transitioning from a product-centric company to a platform company, focused on marketing to millennials through technology. To reflect this new strategic direction, management has decided to change the name of the company to Crowd Media Holdings Ltd at the upcoming AGM this month. Here is Carosa speaking to CommSec’s Tom Piotrowski about the company’s new direction and plans to change its name to Crowd Media. This decision is the result of a strategic review undertaken by the management team. The review identified a number of ways to consolidate on the company's strengths and growth opportunities. It recognised that social media and digital influencer expertise is its strong suit, especially the important marketing to millennials. It has a team that is strong at marketing to this audience and technology driven expertise around Artificial Intelligence (AI) and Business Intelligence (BI). The key operational objectives coming from the review are designed to improve key financial metrics across the business, driving growth and consistency. These include selling third party products on an affiliate basis to expand revenue opportunities; optimise margins and conversion on core products expanding AI and BI technology; continue growing the number of high margin digital products; and unlock new markets with the Q&A app in US and Latin America. As evidenced by its new deal with Snap, CM8 will partner with global brands to assist them embrace and execute digital strategies harnessing the power of influencers and social media. The company’s executive team has also undergone a restructure with focus on operational improvements, higher staff engagements and execution success. Here’s an article from iTWire.com discussing the company’s operational transition to focus on its core strength in social media marketing. CM8’s Q&A products connect those seeking answers with qualified experts. It has moved away from crowd sourced answers and is making investments in Artificial Intelligence. Its future includes connection to voice activated personal assistants like Amazon Alexa and Google Home. For the last financial year, revenue for the division was stable at $24.7 million, while message volumes were up 8% to 14 million. This came as the company focused its attention on larger markets with lower unit price economics. The division is seeing expanded distribution and more diversified revenues with new channels such as Snapchat and YouTube advertising and the continued investment in Artificial Intelligence (AI) and Business Intelligence (BI) technology should improve margins along with the customer experience. The new Q&A app was launched into the US market during the year and is already showing green shoots. Continued diversification is key for growth in this division. Diversified revenues will come from CM8 targeting age groups beyond the core target audience of millennials, as well as leveraging its Q&A and AI platform across new product areas like psychic and chat, and expanding distribution by broadening global social media platforms to include LinkedIn, Twitch and Tik Tok (formerly Music.ly), and others. CM8 will also grow revenues by entering large markets such as US and Brazil with the Q&A app where direct carrier billing (DCB) is not available. Crowd Mobile’s third division, Subscription, delivers mobile content including games, mobile security, applications, education, music and videos to millions of consumers worldwide, promoted across targeted websites and marketing agencies. CM8 is looking to introduce new subscription products across games and virtual reality. The division continues to generate stable revenues and positive EBITDA although the company expects some provisions for bad debts to be made in the current half year. The division has faced some regulatory headwinds that have affected all players in the markets. In response, CM8 has restructured to protect margins and is currently reviewing all strategic options for the business. In the last financial year, ending June 30, CM8 generated revenues of $38.6 million, yet (EBITDA) earnings for the full year were negative — a $23.1 million loss. However, much of this can be attributed to the write off of its Subscription division with a $26 million non-cash impairment charge. Excluding that, underlying EBITDA was in the black at $3.6 million. The Media division generates growing revenues from marketing campaigns on social media platforms, yet it requires ongoing investment for growth which is contributing to operating losses. CM8 is uniquely positioned to execute advertising campaigns for global and European brands leveraging the social media and influencer distribution network that Q&A has built up in over 30 countries. Continue selling new digital products and subscriptions to millennials using social media marketing expertise. This requires limited new investment by selling third party products rather than building its own products. CM8 will look to open new growth channels, such as the US market beyond millennials, through product pivots targeted at other demographics and expanding social media channels. It will seek to maintain profitability in Subscription by expanding content, direct media buying and payment options. Leverage Artificial Intelligence (AI) and Business Intelligence (BI) technology to drive down costs and optimise returns. It will also seek to neutralise Q&A operator costs through third party revenue streams and SaaS licensing of the Q&A platform. Clearly, the company is taking decisive action to address the areas of the business that need to be transformed, all the while being able to capture demand from the Crowd Media division. CM8 is sourcing new products that leverage the global mobile carrier billing channel and decrease the division’s dependency on non-direct marketing. It’s launching improved content focused on high growth verticals such as Augmented Reality (AR) vs. Virtual Reality (VR) gaming and health and fitness. Management is focused on paying down debt and integrating strong foundations from Q&A and Subscription divisions into Crowd Media. With a market cap of just $7.3 million it could well be argued that the company’s potential is underappreciated. The upcoming name change, along with shift from a product-centric to a platform company leveraging its marketing technology will position it well to capitalise on the changing marketing landscape. Its AI and mobile payment distribution network and influencer CRM and workflow platforms further strengthen the business and its new path.